Pchum Ben (Ancestors' Day) is a fifteen-day Cambodian festival, considered unique to this country. 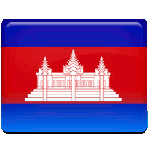 It is one of Cambodia's most important holidays. The final three days of Pchum Ben were designated as a public holiday. Pchum Ben begins on the first day of the tenth month in the Khmer calendar, and its culmination typically coincides with the end of the traditional Buddhist retreat, Vassa. The festival of Pchum Ben usually falls on September or October in the Gregorian calendar. During the festival, most Cambodians pay respects to their deceased relatives. They believe that this is the period when the gates of hell open and pretas (ghosts of the dead, known as “hungry ghosts”) are especially active. So Cambodians placate them with food offerings. It is believed that deceased relatives who are not in hell would also benefit from the offerings. There are two models of food offering. In temples, people give food to Buddhist monks, benefiting the dead indirectly by bringing them merit. Most Cambodians wear white clothing while visiting temples during Pchum Ben. In rural Cambodia, it is customary to throw rice balls into the air or scatter rice across an empty field, “feeding” ghosts directly with physical food.